Michael trained at Guy's Hospital Dental School in London, ENGLAND and also gained a further degree from the Royal College Of Surgeons of England in 1989. 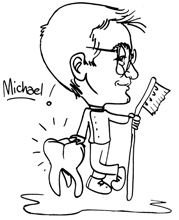 Michael was awarded a Fellowship (FDS) in Dental Surgery in 1993. This is the highest form of Dental qualification given by the Royal Colleges. Michael's GDC number is 64497. The Clinic opened in 1995 and offers a very modern practice with a comfortable and relaxing atmosphere. Providing a personal one to one service. Each time you will see Michael to maintain personal continuity of care. In this practice, teeth are never removed if it is possible to save them. Please see below to find out more about some of our services.